Last month I got help our fabulous beekeeper, Kelly Knapp, harvest her “Summer Blast” honey on the farm! Our intern, Danielle, and I met Kelly at 8 in the morning at her hives by our Goldensweet Apricots. When we arrived, Kelly was unloading tools and bee suits from her big red pickup truck. She asked us if we were ready for the adventure ahead, implying that we were about to get into some tough work. At that point I didn’t quite get what she meant... But she emphasized to stay calm, breathe and drink tons of water. 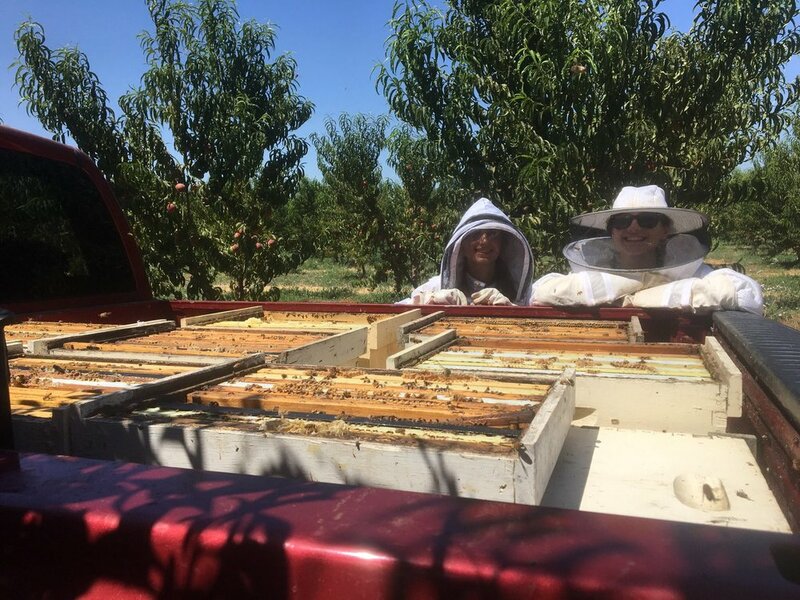 Even though it was over 90° at 8am, we were excited to get suited up in full-body bee suits, with heads zipped in and gloves hiked up to our elbows. Kelly showed us how to crack open the hive lids with tools that look like putty knives. Inside the box are about 10 frames stacked like files. The process is to inspect each frame and decide whether enough honey has collected on it to harvest. Kelly warned us to keep an eye out for brood: baby bees, yet to emerge. If there’s lots of brood on a frame, you leave it in the hive to let those babies hatch! The most useful tool of the day was the “smoker,” a little steel can with a chimney, filled with burning cotton. Smoke calms bees down, which is important since they can get stressed out during harvest. Bees react to human energy- I learned this the hard way. I was really impressed watching Danielle during harvest... she maintained a calm pace, never fumbling or trying to rush. I, on the other hand, have a tendency to move too quickly and got stung 6 times! Not sure how the bees made it through my suit, but I think they were warning me to slow down. Regardless, that day was the highlight of my summer and I can’t wait until next time I can help with the harvest.